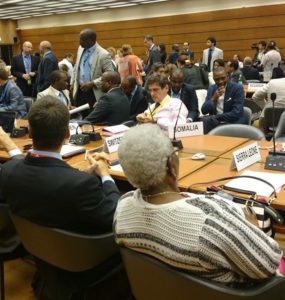 On 19 August, talks at the UN in Geneva to identify ways forward towards nuclear disarmament concluded, with resounding support amongst states and a clear adopted recommendation for starting work on a new treaty comprehensively banning nuclear weapons as soon as possible. After years of deadlock in international nuclear disarmament forums, this is a momentous outcome. 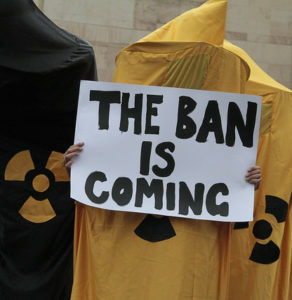 The move for a ban treaty has emerged from renewed concern over the past six years amongst states and civil society at the catastrophic and unacceptable humanitarian consequences of these weapons of mass destruction – weapons that must urgently be stigmatised, prohibited and eliminated, as over 120 countries had already agreed. Following two sessions of discussions during 2016, the Open Ended Working Group (OEWG) adopted a report on Friday evening, with a recommendation that the General Assembly should convene a conference in 2017, “open to all States, with the participation and contribution of international organizations and civil society, to negotiate a legally-binding instrument to prohibit nuclear weapons, leading towards their total elimination.” The report will be sent to the UN General Assembly, where a resolution to start negotiations is expected to be proposed to take this forward. A vocal minority were opposed to this move throughout the talks, based on their reliance on nuclear weapons in their national security doctrines. As a footnote in the report notes, starting negotiations on a ban treaty was supported by more than four times as many states as opposed this – at least 107 states supported the commencement of negotiations in 2017 at the OEWG this year. In an unexpected late development on Friday, following two weeks of negotiation and the expectation that a draft outcome report with recommendations could be adopted with the support of all states, Australia forced a vote on the OEWG’s report – which did not block its agreement nor manage to derail the talks. This action resulted in the adoption by majority of a report with strengthened language, clearly recommending as an outcome of the OEWG (rather than a recommendation from the majority of states) that negotiations begin on the ban treaty. A split in the group opposing a ban treaty was also produced by the vote – with some voting against, and others (such as Japan and the Netherlands, where public support for a treaty banning nuclear weapons is strong), abstaining. The humanitarian initiative on nuclear weapons has already considerably destabilised and produced tensions for the national positions of these states in their support of nuclear weapons. A treaty comprehensively banning nuclear weapons, with or without the initial participation of the nuclear-armed states, would change the global legal and political landscape with respect to nuclear weapons, making clear that the international community as a whole finds these weapons unacceptable. Such a ban treaty would build on the existing legal regime and fill current gaps in the framework with respect to prohibition, providing legal clarity and increasing stigma against nuclear weapons. It would have a significant normative and practical impact through making a series of prohibitions, from possession to cooperation and financing, and including positive obligations such as victim assistance. Throughout the UN talks this year, states returned repeatedly to themes such as the devastating impact of nuclear weapons on people, places and the environment, and the need to respond adequately to the suffering of the victims of nuclear weapons. It is now their responsibility to take this process forward to address the urgent and devastating threat posed by these weapons – a ban treaty is coming.